You can rest easy knowing the experienced professionals of Jim Burke Hyundai are caring for your vehicle! Our new and used car dealership boasts a stellar service department with a state-of-the-art facility. Whatever repair work your Hyundai might need, our Hyundai-trained certified mechanics can handle almost anything you throw at us, whether you're in need of an oil change or a transmission overhaul. We also have an amazing collision center that can get your Hyundai looking brand new again if you've had an unfortunate accident. The Jim Burke Hyundai Service team can handle all scheduled maintenance requests as well. We make it easy to schedule an appointment with our online form, and we also offer many service specials! Browse our aggressive offers today and bring your vehicle in for that brake pad inspection that it needs! When you keep up with the manufacturer's recommended maintenance schedule, you can help avoid some potentially costly repairs in the future, and you can also drive with the peace of mind that comes from knowing your vehicle will turn on when prompted and slow down when needed. From car battery inspections to tire rotations and brake pad replacements, our Hyundai dealership in Birmingham, AL is here for you! We only use genuine parts and accessories when completing our services so that you can be sure your Hyundai Santa Fe is staying authentic! 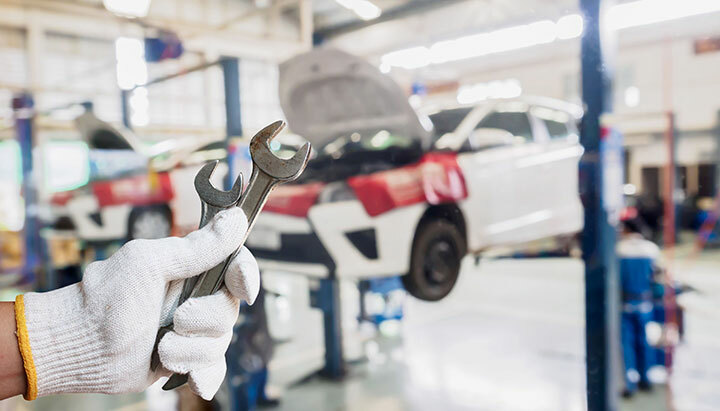 Don't put off your service or repair needs any longer, treat your vehicle to the care it deserves, visit the factory trained professionals of Jim Burke Hyundai today! Proper lubrication levels are essential to your Hyundai engine running correctly. If you are searching for an affordable oil change near Birmingham, AL, come to Jim Burke Hyundai. Motor oil reduces friction, wear, and heat among the moving parts of your engine. Significant damage can occur if the oil is not changed regularly. Our Hyundai dealer takes pride in providing Hoover drivers with premium oil services at affordable rates. We like to keep the cost of maintenance affordable. The service deals and parts specials we offer make it easy to book an oil change at competitive prices. Contact our service department to schedule your oil change today! Here at Jim Burke Hyundai, we provide Birmingham, AL, drivers with comprehensive tire services and new tires for sale. Our staff of certified automotive technicians is ready to mount, balance, and align your new tires. Schedule your next wheel and tire alignment at our new and used Hyundai dealer near Hoover. As soon as your new tires are mounted and balanced on your Hyundai, you'll enjoy the enhanced fuel economy, stopping ability, and performance that comes from quality tire services. Tires are the only touchpoint between your automobile and the road. Make sure they are properly inflated, rotated, and balanced, to keep you and your passengers safe. Jim Burke Hyundai employs a skilled service team. Our certified mechanics are eager to perform your next Hyundai brake service. The brakes on your vehicle are a vital safety component. If you don't remember the last time you had your vehicle's brakes inspected or serviced, speak with our Birmingham, AL, automotive team. We provide Birmingham, AL drivers with quality brake repairs and diagnostics. Regular brake service and repairs will keep your vehicle stopping safely. Experience the sense of security that comes from driving after a professional brake job at our Hyundai dealer. Visit Jim Burke Hyundai for brake services today. Here at Jim Burke Hyundai, we offer battery services designed to preserve the life of your car's battery. To keep that battery in your Hyundai operating and lasting longer, come to our Birmingham, AL, Hyundai dealer. Our team of certified mechanics will charge your battery and test its voltage capacity while checking your charging system for acid leaks, corrosion on the posts and terminals as well as other indicators. We carry a full array of quality battery replacement options from top manufacturers. Bring your battery to our service department for a quick battery test. Trust that you will always receive premium replacements and repairs, schedule your battery test today at Jim Burke Hyundai and discover more about our battery services. From oil changes, tire service and wheel alignments to engine tune-ups, hybrid and electric powertrain service and warranty work, turn to the auto service experts at Jim Burke Hyundai, serving drivers near Birmingham, AL! Here on our website you can schedule a service appointment for auto repairs or routine maintenance.